Athletics was long considered a stumbling block for China, perpetuated by the myth that Asians lacked natural ability in track and field. But that stereotype has been shattered again and again by Chinese athletes so far this year. Team China will be out to prove it again at the Asian Games in Jakarta, Indonesia, from Aug 18 to Sept 2. On Monday, the General Administration of Sport of China unveiled a strong delegation for the Games, including a star-studded contingent for athletics. The brightest stars on the squad are sprinters Su Bingtian and Xie Zhenye, who have showed great momentum so far this year. Su tied the Asian men's 100 meters mark of 9.91 seconds with a tail wind of 0.2m/s at the IAAF World Challenge meet in Madrid in June - three days after Xie blazed to victory in 9.97sec at the Meeting de Montreuil in France, becoming just the third Asian to run the 100 under 10 seconds. The 28-year-old Su's previous personal best of 9.99 was achieved at the 2015 IAAF Diamond League meet in Eugene, Oregon, and equaled at the 2015 World Championships, when he became the first Asia-born sprinter to clock under 10 seconds. After three years of waiting, his record was finally broken by the 24-year-old Xie - fulfilling a vow he made earlier this year to become the next Chinese man to eclipse 10 seconds. Su proved himself again when he clocked a wind-assisted 9.90 at the third stop of the IAAF Diamond League in Eugene three months ago, and he also claimed the overall 60m title on the IAAF World Indoor Tour. Xie, who also set the 200m national record with a time of 20.16 in May in Japan, is considered China's best shot at gold in the 200m. While the Chinese sprint duo are expected to bring home gold in the 100, 200 and 4x100m relay in Jakarta, their strongest competition will likely come from Japan. The athletics battle between the two regional powers has been going on for years, and the pressure was ramped up last year when 22-year-old Yoshihide Kiryu became the second Asian to eclipse 10 seconds in the 100m when he clocked 9.98 in Fukui. However, Kiryu's erratic performances this year means he will not participate in the 100m and 200m events, replaced by Ryota Yamagata and Aska Cambridge respectively. Both were part of Japan's 4x100 relay team that captured the silver medal at the 2016 Rio Olympics. Su and Xie are going to the Games in a high state of confidence. Su posted three pictures of the Chinese sprinters - including himself and Xie - on Weibo on Tuesday, saying: "This is a reunion of China's sprinters and we will show our absolute Chinese speed in the Games!" On the women's side, Wei Yongli, who took gold in the 100m and 4x100m relay and silver in the 200m at the 2014 Incheon Asian Games, is expected to defend her titles in Jakarta. In the 110m hurdles, Xie Wenjun, who pocketed gold in Incheon, will fly the flag for China once again in Jakarta. The event has been a favorite of Chinese fans since 2004, when Liu Xiang won gold at the Athens Olympic Games and became world champion at the 2007 World Championships in Osaka. Injuries forced Liu to retire in 2015, and Xie has been groomed to be his successor. 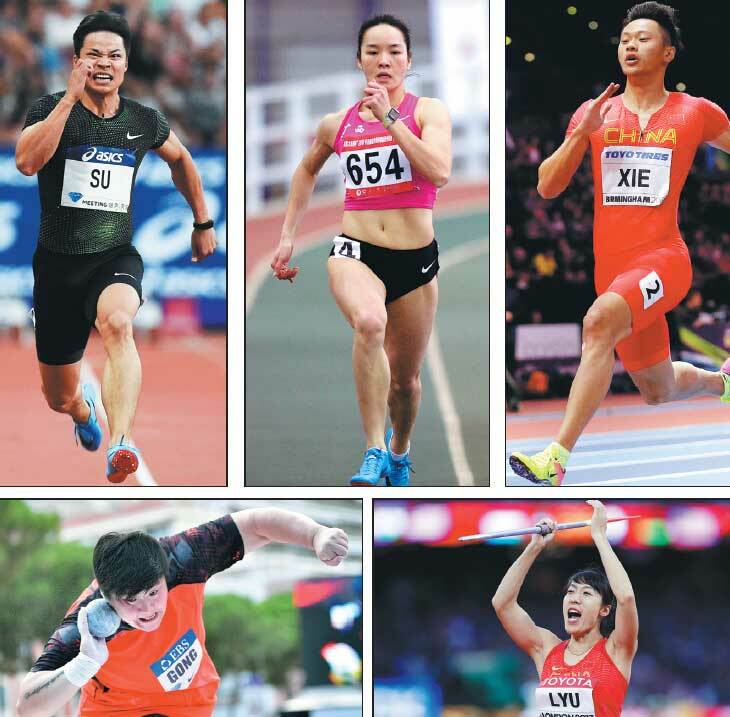 Another big name is Chinese female shot put world champion Gong Lijiao, who showcased her consistency with a victory at the IAAF Diamond League meet in Monaco last month. Gong was crowned world champion at the Athletics World Cup in London, and in June made this year's world-leading heave of 20.38m. The 29-year-old Gong helped China win its first gold medal at the 2017 World Championships in London and pocketed silver at the 2012 London Olympics. Another Chinese contender at the Asian Games is javelin thrower Lyu Huihui, who won silver at the 2015 World Championships and bronze at the 2017 worlds. Her personal best of 67.69m is the women's Asian record.